is a graphic design bureau located between 14 avenue Foch, Metz, France and Olhauer straße 38, Berlin Germany, untill the end of April 2018. It is composed of four graphic designers (Émilie, Francis, Julie and Xavier) driven by the same desire for creativity, interdisciplinarity and quality. Since 2013, Nouvelle étiquette has managed graphic design projects for cultural associations, public institutions, private companies and sometimes big capital. Thought as a place between a graphic design studio and a research workshop, the bureau nurtures the personal experiences of its members. Nouvelle étiquette is defined by an approach that emphasizes the search for meaning as the driving force behind the emergence of relevant graphic forms. Its work is also based on a particular sensitivity to typography, contemporary art and literature, as well as a way of seeing graphic design as a source of understanding and joy. The creative bureau pays the greatest attention to a deeper comprehension of its commissions and strives to establish constant dialogue with its partners. Nouvelle étiquette regularly takes part in conferences and workshops, while some of its members teach at art school in order to transmit, share and advance knowledge in graphic design. is a graphic design bureau located at 14 avenue Foch, Metz, France. 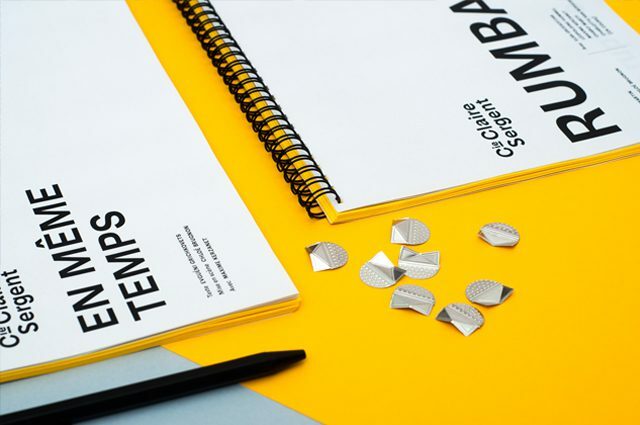 Created to be a place between a graphic design studio and a research workshop, it consists of four graphic designers driven by the same desire for creativity, interdisciplinarity and quality. Here’s a selection of our works. Wanna see more? Try the desktop version or visit our Behance profile! For the first edition of the event, the networks decided to ask Nouvelle étiquette to design an editorial object that would allow to regroup all the events of the weekend. The structures also wanted to dedicate a bit of this publication's space to a "carte blanche" given to an artist. We designed a "newspaper-like" publication that can be declined every year to constitute a little collection. Two gradient colors are marking the identity of the object. For each new publication, we will re-use one of the two previous colors, which will create a color continuity though every years' documents. At the heart of the edition, a central sheet of paper can serve as a poster to be self-composed by the reader. 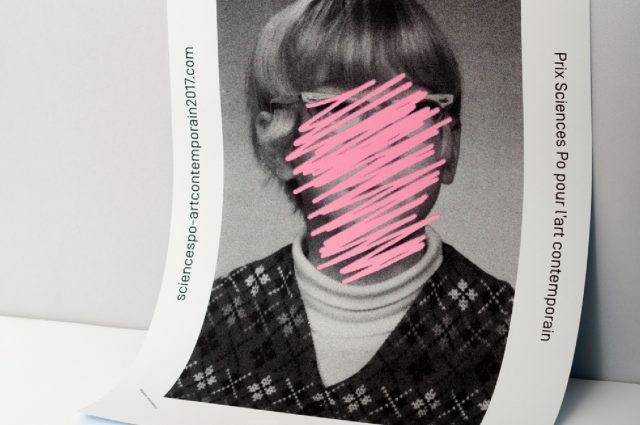 Indeed, if one gather two documents, one can constitute a big poster regrouping the intervention of the invited artist (2018: Delphine Gatinois) and the informations about the event. The organizers of the event and the participating spaces (galleries, art centers, libraries etc.) can display this poster on their walls and the public can keep the intervention of the artist as a personal "souvenir". Every year since 2010, the "Sciences Po" prize for contemporary art is organized by a team of students from the prestigious school. It is rewarding a young artist working in France, among a selection of ±10 people that are selected to show their work in a dedicated parisian exhibition. In 2017, the organizing team contacted us to design all the visual communication of the new edition, which was focusing on the theme of "at face value". We decided to print the majority of the communication elements in silkscreen, on only a single sheet of 120x176 cm. Once cutted-out, this sheet allow the prize to use various declination of A2 posters, A3 posters, A4 posters, jackets for the exhibition's catalog and invitation flyers. Using the photographic archive of "La Conserverie" (the national conservatory of family picture in France), as well as 3 "primary" bold colors, we installed a versatile, playful, straightforward and upbeat identity. For over 40 years, the Orchestre national de Lorraine has been a major player in French and international cultural life. Its repertoire is demanding and eclectic, placing equal value on both the great classical works and contemporary creations. After a first year of fruitful graphic design cooperation, the orchestra has again invited us to create their visual identity for the 2016-2017 season. 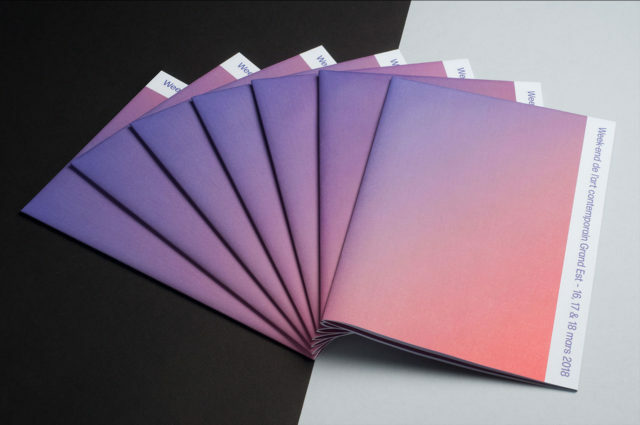 We designed a strong, subtle and ethereal graphic identity. With the poem "La Chevelure" by Baudelaire as a common thread, we created a set of graphical backgrounds, considered as multiple resonances of the talent of the artists invited by the orchestra. These soundscapes display a demanding and contemporary identity, distilled through the orchestra's various documents. 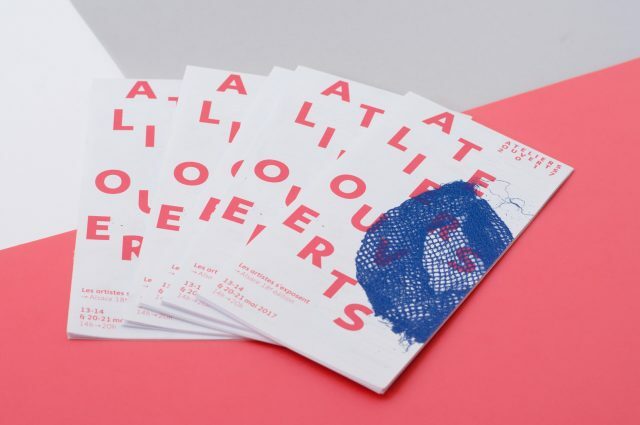 The Ateliers ouverts, organized by the contemporary art association Accélérateur de Particules are for us, since the last 4 years, the occasion to explore a collaborative way of creating an event identity in close collaboration with artists who are working with various mediums. Every year in May, during two weekends, artists from all the Alsace region are opening their studios and organizing events, performances, visits… Accélérateur de Particules is also organizing a special opening night, some professional meetings and networking events. All the participating artists of every year are also being included into a directory, that constitutes the biggest reference of the art scene of this area. For each edition, we are designing posters, postcards, badges, and the programme in close dialogue and collaboration with one of the participating artists. To do so, we are using small guidelines that allows us to reach consistency through each edition while having every time a fully different communication. 1. We meet with the artist and discuss about her/his work 2. We don't put one of its artworks on the posters, but we rather seek for its personal "recipe" and try to translate it graphically to create new forms 3. We always use the two same spot colours, and the same typeface. This year, following the same method, we worked with Estelle Chrétien, who is making tampon drawings, embroidered sculptures and in situ installations to achieve a lively and bold identity. In 2010, Pascale and Laurence, who were passionate about agriculture, ecology and wine, decided to create their own wine estate to produce originals wines inspired by the principles of biodynamics. 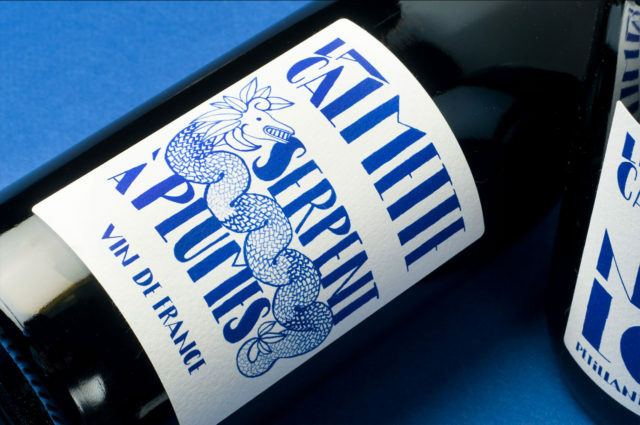 They therefore entrusted us to design the graphic identity of the estate and of each vintage from the start. We created an identity with an uninhibited creative twist. 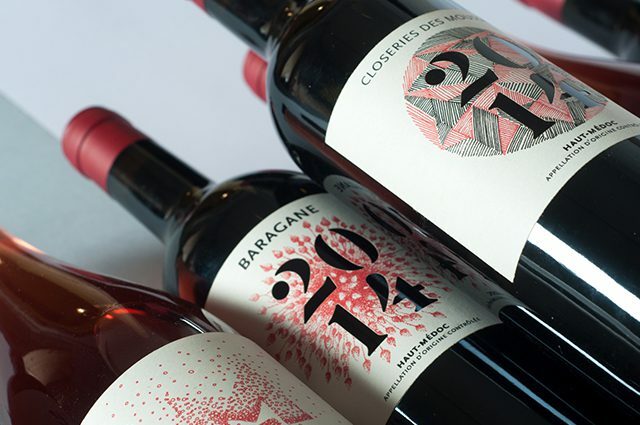 The subtle blend of precision and finesse of the custom designed stencil figures and the artisanal and warm dimension of the illustrations accompanies and characterises each wine. The red colour, common to all the productions, is a strong marker of identity by referring to both the wine and the region in which it is produced. Le Périscope is a free scientific magazine. Its articles are intended to make accessible and visible the academic research work of young scientists and students in the field of arts and culture of the University of Lorraine, France. For this project, we supported and advised the editorial board of the magazine from scratch, in order to create an complete interesting editorial object, that fullfils the challenges of such a publication and which is both graphically appealing and comfortable to read. To do so, we designed a magazine that explores the concepts of verticality, plans and scale changes, through a bold layout design and the use of a very identifiable typeface (Amster, designed by Francisco Gálvez and distributed by Pampatype). 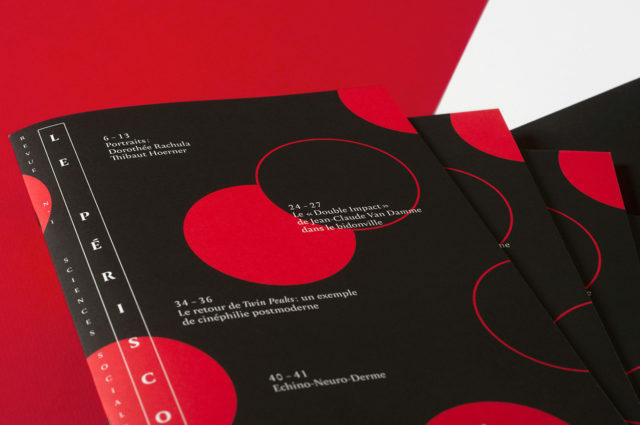 A combination of black and a striking colour also installs a flexible graphical principle that can be adapted to each publication and allows for a sequence of simple and effective folios. For over twenty years, Accélérateur de Particules has been organising the opening of artist workshops in Alsace during the month of May: events accompanied by presentations, school visits, professional meetings and a directory of contemporary art in Alsace. For this year's event, we relied on François Génot's artistic work to propose communication documents that display the same degree of plasticity as the works of the participating artists. Each communication elements of the event displays a "clue" on the way the artist is creating his artworks. François, among other things, is creating some "giant sized" stencils. In order to creates those stencils, he is using some objects or plants he finds during his walks around his workshop. He then "paints" the shadow of those objects on paper. The big posters have been created in a close collaboration with François Génot. We designed two different typography based patterns, printed in silk print, and we produced with him 100 unique hand made posters that were displayed in the Strasbourg area, accompanied by the "classic" smaller posters printed in offset. Those smaller posters (and every other communication object) are displaying the painted objects that we used to create the big posters. While she is working as a graphic designer at Nouvelle étiquette, Julie is also pursuing a career as a plastic artist inside the bureau. She mainly conducts research work based on drawing. The resulting graphic traces constitute the materialised physical part of her work. But here, the drawing is especially considered as a kind of common approach of the expression, as a first language. It is through the "familiarity" of this medium and its universal character that Julie establishes participatory action protocols. Drawing becomes a vehicle for dialogue between her and other people. It is a way of opening a door with no consequences other than creating and sharing moments together. The Centre Pompidou-Metz is a structure dedicated to modern & contemporary art. It opened in Metz in 2010 as the first offshoot of a national cultural public institution. Since then, it quickly became a major cultural centre in the Grand Est region and in France. 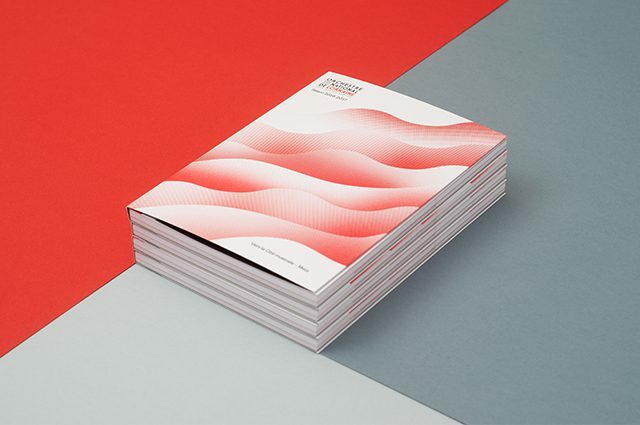 To better communicate its diverse arts programming to its many visitors, the Centre Pompidou-Metz has entrusted us with the complete graphic redesign of its biannual publication. We are designing the Centre's agenda as a book that accompanies the visitor, like a small diary that you can put in your pocket. Organised using a colourful, efficient and convenient system, the Centre Pompidou-Metz's agenda allows everyone to find the information they are looking for easily. The Compagnie Claire Sergent was founded in 2012 by theatre director Chloé Brugnon. At the heart of its concerns: our everyday life, its share of the strange and the extraordinary, but also the intuition that theatre is a place of cohesion that transforms intimate experiences into universal experiences. The Compagnie Claire Sergent has asked us to transcribe its aesthetics and theatrical research into a coherent and intelligent visual identity. We designed the identity of the company starting with a custom typeface. "Claire Sergent" is inspired by the first "sans serif" typefaces published by the German and British type foundries in the late nineteenth century. The typeface seeks to transmit the company's texts, infusing a feeling of strangeness throughout its documents. The italics are replaced by a deliberately awkward oblique. Too much slanted, drawn without any optical corrections, the "Claire Sergent" oblique adds a sense of “je ne sais quoi" to the composed texts. It thus establishes a direct link with the texts that the company stages, where the ordinary slowly cracks and gives way to a disturbing form of poetry. This feeling is reinforced by a deliberately rational composition of documents published by the company, using minimal graphic effects. 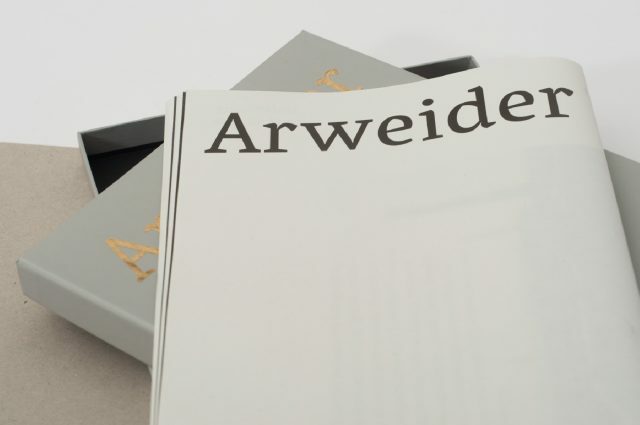 Arweider is a local word meaning "worker" in the Bictherland, an small area of the North-Est of France. Julie and Anne Delrez chose to call their exhibition at "La Grande Place, musée du cristal Saint-Louis", by this name. The exhibition aims to retrace the stories of various workers of the crystal factories of the valley. Many meeting with the inhabitants of the area allowed Julie and Anne to better determinate who were the people that are making the heart of crystal factories. Each person that the artists met chose with them a few objects he or she felt connected to, and displayed them in the exhibition space. From Meisenthal to Saint-Louis, from Goetzenbruck to Montbronn, Lemberg, Soucht, Wingen-sur-Moder, the two artists collected the images and the stories during months, until the exhibition. "At first, we knew nothing about the crystal factories that punctuate the daily life of this territory. With generosity, the inhabitants of the « étoiles terrestres » teached us how to know, to understand and to love thoses sparkling objects that they proudly put in the windows of their homes. Small and fragile things that tell so many stories… Glasses, vases, carafes survive to humans, are transmitted from generation to generation, and, sometimes, break." The exhibition's catalog has been thought with the artists as a true "present" to the inhabitants of the valley. The catalog was distributed freely to the visitors of the exhibition. Inside a luxurious box evocating the precious casket in which the crystal is delivered, pages of a journal are graphically displaying stories of ordinary people. Arweider, an exhibition at "La Grande Place, musée du cristal Saint-Louis"
La Calmette is a brand new French wine domain developed by two passionates: Maya & Nicolas. On the hills of the Cahors region, in the south-west of France, they are working in their vineyards in harmony with the nature. They are producing natural, lively and artisanal wines that are faithful to their original territory. It is when they discovered the work that our studio made for the "Closerie des Moussis" domain that this duo decided to ask us for designing their identity and labels. To do so, they allowed us to have a huge liberty in our proposals, as the only thing that we had to respect was the name of their wines, inspired by the experiences of the couple and the territory in which the vineyard is implanted. We designed for them a fully handmade visual identity, coherent with their convictions and their philosophy of making their wines. All the images we produced for the domain was fully created with brushes ands ink only, in a visual style at the halfway between tradition and contemporaneity. One powerful (and quite unusual for this field) blue color has been used to reinforce the result to achieve warmful project that is now declined on every of their bottles. "Pangramme: learning type design" is an exhibition that seeks to establish an overview of the current stage of student type design. 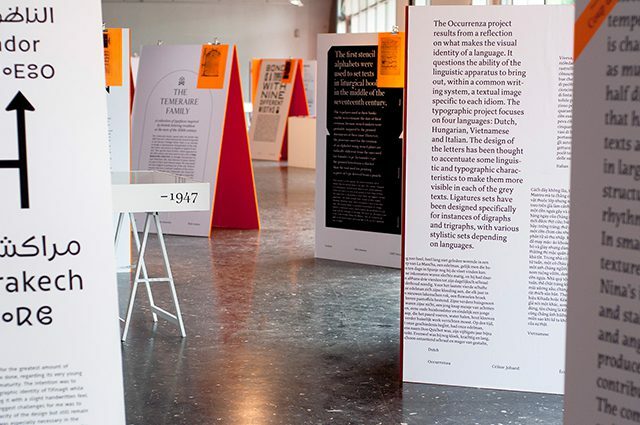 This exhibition and its catalogue were created, organised and designed by the Graphic Design & Typography class at École Supérieure d'Art de Lorraine – Metz, under the direction of Jérôme Knebusch with assistance of Francis and Rafael Ribas. A professional jury (Hans-Jürg Hunziker, Andrea Tinnes, Matthieu Cortat, Gerard Unger and Alejandro Lo Celso) selected 50 projects for the exhibition from an international call for applications. Of these projects, 5 were designated as the "favourite" of each member of the jury and 15 others received an "honourable mention". Pangramme also presents a selection of books about typeface design and graphic design from the 20th century. Finally, there is the complete archive of the call for applications. The catalogue was distributed free of charge on the opening night. Carolinéale, the typeface designed by Francis, received at Pangramme an honourable mention. Design City Luxembourg is a biennial show thought as a laboratory of ideas, interested in the issues of public space design and its resonance in our daily lives. Artists are invited to use the city as a basis to offer the public an experimental approach to design. Invited jointly by the MUDAM - Luxembourg Museum of Modern Art - and the Design City biennial show, we had free rein to invest the closing of the site of the Court of Auditors of Luxembourg City. We suggested a constrained, gradual and ephemeral typographical installation. Our proposal reinvests the public space by offering the reading of poetic and offbeat phrases about the place where it is visible. In order to minimise costs and introduce an additional graphic constraint, we used illegal postering codes. The installation has been printed on hundreds of A3 sheets, assembled on site to form a visual display of several square metres. Upstream of this work, we ran a writing and typeface design workshop with Gaëtan Naudet-Celli at a high school in Luxembourg. "How To Do Things With Words" gave rise to a custom typeface for this project. 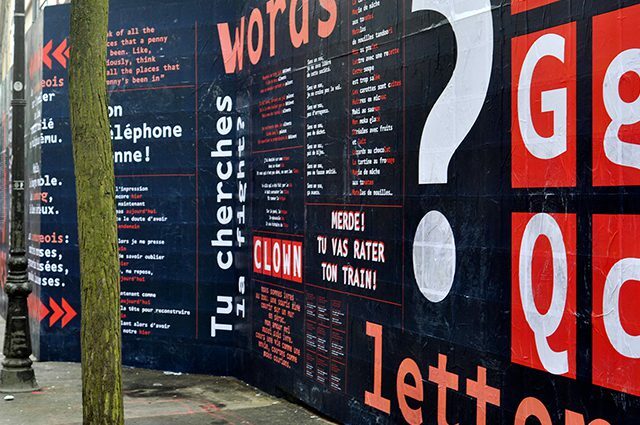 Letters from "Luxembourg mono" integrate the constraints of the installation. Their size and spacing are determined by the proportions of an A3 sheet. Each glyph therefore refers to the construction grid of the set. Accélérateur de Particules aims to promote contemporary art and support young artists working in Alsace and along its borders. The association conducts various projects including exhibitions, visits of artists workshop, etc. 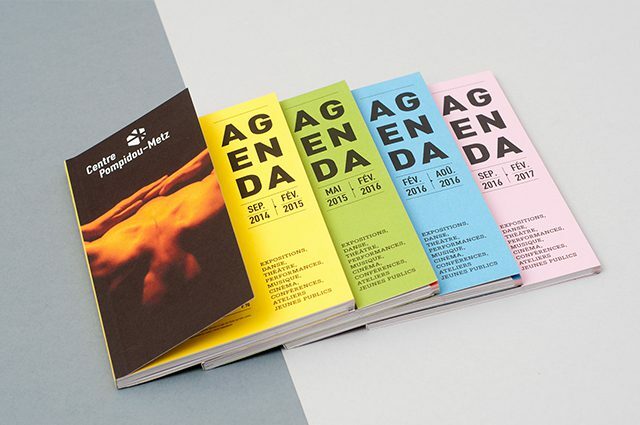 Founded in 2005, the association suffered from a poor image and reputation in relation to the events and exhibitions it produces. It has asked us to develop a global identity that emphasises its actions and makes them visible. 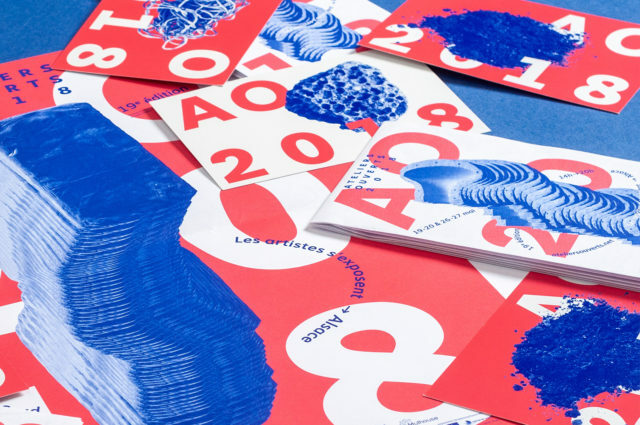 We completely redesigned the identity of this structure, as well as the different moments it organises throughout the year: La Dînée, Ateliers ouverts, Grenzgänger and Regionale. 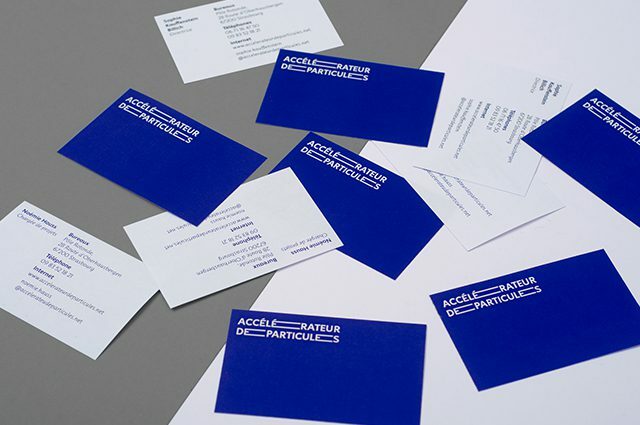 Accélérateur de Particules now uses the same identifying blue colour for all its documents, and writes its texts using Instant, a typeface exploring the graphic implications of the shift of speed in the design of the letter, designed by Jérôme Knebusch. Finally, the Accélérateur de Particules' typographical sign expresses the flexibility and vitality of the association with ease. Metz has no fewer than 41 listed monuments, 3 sites and 58 buildings listed as historical monuments. To better understand the diversity and specificity of this heritage, the Cultural Heritage Department has compiled a comprehensive inventory of the city's architectural treasures. This city town department has asked us to design a book highlighting these notable buildings. It gave us the opportunity for a greater freedom of action in order to design an elegant edition to do architecture of Metz justice. 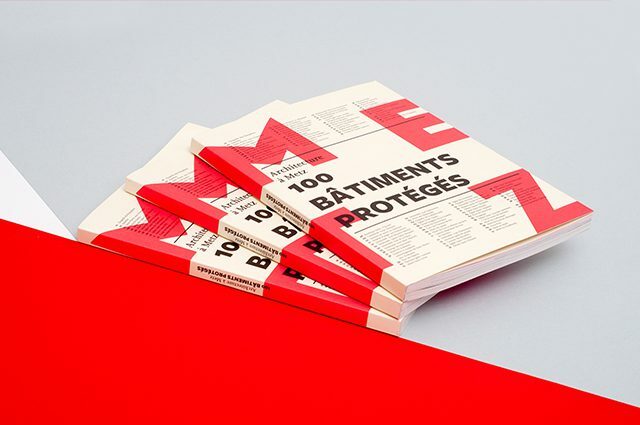 "Architecture in Metz: 100 bâtiments protégés" is a book, a guide and a scientific work at the same time. We designed a cover with a strong graphic impact, where the typography is ubiquitous. The cover area is used to present the contents of the book at first glance. Inside, folios show the principle of the general index: one number per building. The system is galvanised by a graphic play on the scale and placement of numbers. Finally, the ubiquitous yellow refers the reader to the dominant colour of the city, which was partly built using a yellow "Jaumont" stone. « Les éditions Hiatus, une volonté de faire », conference, Rencontres internationales de Typographie, Lurs, Provence. Pangramme, learning Type Design, workshop with the student of the graphic design & typography cursus of the Metz Art school: Graphic design, editorial design and exhibition design. Accélérateur de particules, Adidas (Herzoguenaurach-GER), Alstom, Amadeus avocats, APAP (New York-USA), Athemium, Benjamin Berceaux, Blotter Atelier, Bouygues construction, Bouygues Telecom, Casalib, Centre Pompidou-Metz, Compagnie Claire Sergent, CINARS (Montréal-QC), CIREMM, Closeries des Moussis, Comité national de liaison des EPCC, Cyrielle Lévèque, Département de Moselle, Domaine de la Calmette, DRAC Lorraine, Faux Mouvement centre d’art contemporain, Fensch Toast, François Martig, Grand Besançon, Groupe Lucien Barrière, Hachette éditions, Haute Autorité pour la transparence de la vie publique, Kazak productions, La Revue Automobile, Les éditions Hiatus, Mairie de Besançon, Mairie de Lens, Mairie de Paris, Ministère de la Culture et de la Communication, Moselle Arts Vivants, Musée d’Art Moderne Grand Duc Jean (Luxembourg-LUX), Musée d’Art Moderne et d’Art Contemporain de Nice, Musiques Volantes, Off-Jazz Montréal, Office du tourisme de Biarritz, Orchestre National de Lorraine, Pampatype (Cordoba-ARG), Parc Naturel Régional des Vosges du Nord, Périscope, Prix Science Po pour l’art contemporain, RATP, Ville de Metz, We are Ludwig (Luxembourg-LUX).